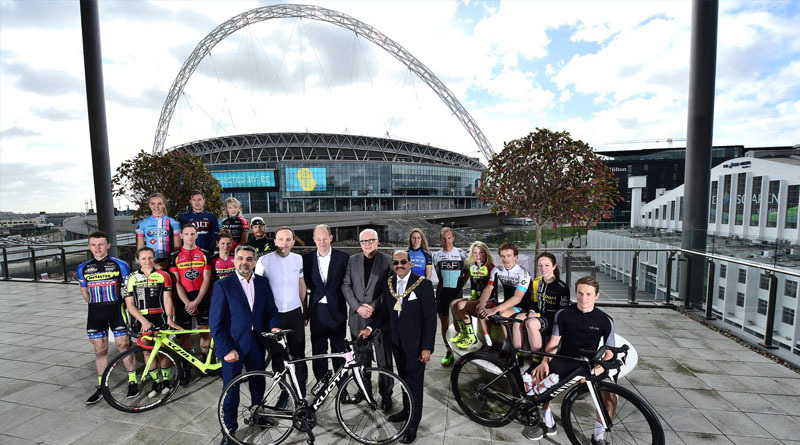 The Tour Series 2017 has been launched at Wembley Park today (Thursday 2 March) alongside details of the ten venues who will welcome Britain’s top professional cyclists this May in the ITV4 Series. Entering its ninth season of competition, the unique, televised race Series has a revamped calendar now taking place entirely within May, and including three new events at London’s Wembley Park, Northwich and Aberdeen, and a Bank Holiday grand finale, for the first time ever, on the 29th May in Stevenage. The Tour Series will also hold Saturday night events for the first time, with a brand new circuit in the heart of Bath being the first on 20th May, before the iconic Durham circuit hosts the penultimate event on 27th May. The Series will also for the first time, hold an event in Wembley Park, an area undergoing a landmark regeneration, with races on a 1.5km circuit of the area, including the concourse of Wembley Stadium and Olympic Way, known to fans the world over as Wembley Way. The three weeks of competition will also feature eight women’s events for the first time ever, as the Matrix Fitness Grand Prix Series expands with thirteen teams due to take part, showcasing the growth in the women’s sport. They will be joined by seven professional men’s teams, headlined by defending champions JLT Condor, and including ONE Pro Cycling, who return to The Tour Series after a year away. 2015 Champions Madison Genesis return along with Team Raleigh GAC, Bike Channel Canyon, Metaltek Kuota and Series debutants Morvélo Basso. Commenting on the 2017 Tour Series, Mick Bennett, Race Director of organisers SweetSpot said; “We are delighted to be bringing The Tour Series to Wembley Park. We are privileged to have the opportunity to race in this spectacular location and one that is so synonymous with world-class sporting events. This year’s Series has a fantastic range of venues, including new events in Northwich and Aberdeen that will bring the events to new audiences. “There are more women’s teams than ever before, reflecting the growth of the women’s sport, while the line-up of men’s teams is incredibly strong, with no clear favourite among them for the Tour Series title. Speaking at the launch, Angus Dodd, Chief Executive of Quintain said, “Wembley Park is delighted to play host to such a prestigious event as The Tour Series. The wide open boulevards and event spaces are perfect for a cycling event. Even the pedway has at last found a positive use. This area is fast establishing itself as adestination alive with activity and experiences as well as a place to live. As a keen cyclist myself, I greatly look forward to welcoming the elite, amateur and youth racers and the local communities from across Brent and the Greater London to Wembley Park in May. It is very exciting for Quintain to be part of this.”? Wiggle will increase their support of pro cycling with sponsorship of the Wiggle Points Jersey within the men’s races, while leading alcohol free wine brand Eisberg will partner the equivalent women’s jersey. Brother UK will be the Official Results Partner and sponsor of the Fastest Lap competition for the second successive year. Matrix Fitness continue as the title partners of the women’s series, while there remains an opportunity for a brand to take overall ownership of The Tour Series as title sponsors to Britain’s leading televised race Series. The Tour Series will get underway in Worcestershire for the first time, with Redditch hosting the event for a sixth time on Tuesday 9th May, including an opening Team Time Trial event for the men’s teams. Stoke-on-Trent and Northwich will complete the opening week on Thursday 11th and Friday 12th May. Week two will see a brace of London events, with the iconic location of Wembley Park hosting Round Three on Tuesday 16th May, that will see riders racing around the outside of the world-famous stadium, and along Wembley Way before the finish in front of London Design Outlet shopping centre. Round Four will be in Croydon on Thursday 18th May before The Tour Series returns to Bath after a year’s absence on Saturday 20th May. Scotland will again host two events, Motherwell for the third successive year on Tuesday 23rd May and a new event in Aberdeen on Thursday 25th May. The penultimate race will be in Durham on Saturday 27th May before the final round in Stevenage on Bank Holiday Monday, 29th May. Highlights of every round of The Tour Series will be shown on ITV4, with programmes also be available on demand via the ITV Hub.